Old Bill was born many, many years ago- and was given his first knife- a 2-7/8 " Schrade double-ender, by his father when he was about 7 years old. The spring on the large blade was broken, but the pen blade worked well. A few days later, on a family outing to a relative's farm, I lost this wondrous piece of cutlery. This is what started my lifelong love affair with cutlery. When I was in elementary school I would cold-forge miniature sabers from nails, wrapping the handles with wire. Being a pretty good musician, I got to hang out with guys that were quite a bit older than I and one of them told me about a classmate and fellow musician who had 2 switchblades. I called him and he brought me one of them. I was a little disappointed. This thing was bright orange! And it had this weird hook blade on the other end. Nevertheless it was a switchblade and I had to have it! Later, he sold me the other one. Both were Schrade MC1 paratrooper knives. To this day I have a fondness for this model. I still have the knives. The Schrades started a quest that would last a lifetime. Asking everyone I knew, I was able to find a knife every once and a while. The next was a Hammer Brand toothpick with striped scales. Then a lever lock via Mexico. There were many others over the next few years. As I got older, I became interested in firearms of all types. There were two gunshows a year in my town, and I started going to them- asking about switchblades. Out from under the tables would come all sorts of wondrous old knives. I stayed broke, between the guns and knives. Occasionally, in the "Shotgun News" there would be advertisements from individuals selling switches. I think I bought them all! Now, how does one go from collector to repairperson? Well, let's back up a few years. After getting that first MC1 Schrade, I carried it and played with it incessantly. One day, as I closed the knife- "CRACK"- the spring broke! I was heartbroken. Then I remembered a gentleman named Ed Hagstrom. Mr. Hagstrom was a gunsmith in our neighborhood. 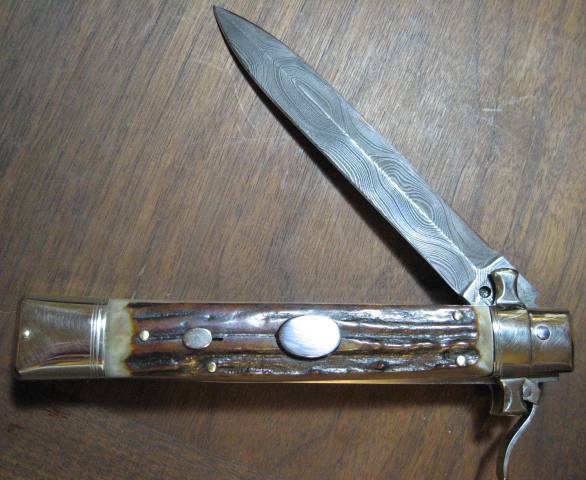 He had repaired a rifle for my dad and I. I got on my bike and rode to his house with my pitiful Schrade in my pocket. If anyone could fix it this wizard could! Seeing the look of desperation in my eyes, he said he would see what he could do. A heavy burden had been lifted off my young shoulders! A couple of years later I was in high school shop class. There were lathes, grinders, presses- all kind of machinery from the liberty ships of WW2- donated to the public school. I became proficient in the use of the tools, and when another spring would break I just took the knife to school and repaired it! Those were the days! Make no mistake- I screwed up a bunch of knives in the process. I got a reputation among the kids for fixing knives, so many broken ones came my way. Mr. Hagstrom was always there to answer my questions. Fast forward to age 21. I began making pistol grips out of plastic for friends and was looking for someone to machine-engrave some initials on them. I was bounced from jeweler to jeweler until I got to Virgil Hays. Virgil was impressed with my ability and offered me a part-time job. I was working nearby for the local government on midnight shift, so when I got off I went to Virgil's shop. MAN! -Talk about alchemy! This guy knew how to do EVERYTHING! And he was a master at all of it! He had old books, lots of machinery, tiny torches. The man was a master jeweler and took me under his wing. He gave me full use of his shop. Along with learning the jewelry/hand-engraving trade, I was able to work on my knives and guns. This is where I honed my skills at repairing, engraving, and making knives. Sadly, Virgil passed away many years ago. I miss him dearly. At the gun shows and at my job I met knife people. Jimmy Lile praised the first knife I made; though it was very crude. Pat Crawford, A.G. Russell, Joe Dennard, Bill Adams became my friends. I got drafted to write the first modern magazine article on switchblades- "American Blade" magazine, Vol. 2, number 6. After a bitter divorce at an early age, my interests turned to things other than knives. Music had always been a staple, but it became my main interest. I was fortunate enough to work with most of the fine musicians that were responsible for the "Memphis Sound". No- not Elvis, but most of the others. I did custom work-plating and such for Strings-n-Things music, sold and made fine jewelry, got a Federal Firearms license and engraved guns, built custom guns, all the while working for the local government as a steam and refrigeration engineer. Quit the job once and became a "bond daddy." That didn't work out, so I went back to my government job. Went broke a couple of times, and sold almost all the knives and guns. I sure wish I had all of them now! Fast forward to the not-so-distant past: Discovered the knife scene on the Internet. Met Ms. Debbie, fell in love, got married. Ms. Debbie showed an interest in the guns and knives, which were always something I bought when I had the chance. When we got married, I built "DeShop"- 480 square feet packed with years of accumulated equipment. I figured this was a good way for us to do something together. It has worked out well! I enjoy the challenges of being a cutler. I am a craftsman, and being in the cutlery industry allows me to fully utilize all of my skills.